Surprisingly inexpensive deals you should treat yourself to. Amazon Prime Day, the day when Amazon posts more deals than you could ever conceivably look through in a lifetime, is here! We waded through the mountains of bargains for you and found some of the best deals in every category (in this case: all the gorgeous, awesome, must-have things that cost way less than you might think). All Prime Day deals are limited quantity and subject to rapid change, but we'll be doing our best to keep this post updated and accurate. Note: To get these deals you have to be a Prime member, so if you aren't already, sign up for a free 30-day trial here. 1. A set of five spinach, citrus, and red wine–infused antioxidant sheet masks for 30% off. Promising review: "I am an avid skin care junkie and do at least three sheet masks per week. I've tried a myriad of mask from various companies and by far these are my fave! These feel amazing while on and stay put without sliding off and my skin looks energized and refreshed. I love these so much that I stock up whenever I can." —Tiffney T.
2. A trio of flameless candles so you get tons of ambiance without burning your house down for 72% off. Plus they come with a remote control so you can turn them on and off from the comfort of your own couch. 3. A set of four makeup blending sponges to flawlessly apply foundation for 20% off. That's right, FOUR sponges for less than the price of one beautyblender! 4. A super popular retinol cream (it has over 2,000 five-star reviews) for 50% off — PLUS an extra $5 off coupon! Promising review: "I wished there was a way to give this product 10 stars. Let me first say I'm a VERY picky retinol user. I usually use a high end organic product (aka: Origins) but thought I'd give this one a whirl given the reviews. I'm a tried and proven convert now. I LOVE this product. It is so luxurious, never causes burning, peeling or redness. Truthfully, I think this is best retinol cream I've ever used and that's just how it FEELS on my skin. Let's talk results. This product changed the playing field. With one use, I could tell this was different. I'm addicted now and have a hard time finishing up my other products! People at work ask me what I'm doing to my skin. They tell me how super soft, supple and radiant my skin looks. I thought it was just me that noticed but others have too. I don't want to waste any other existing product so I'm going to still use that up first before ordering more, but once it's gone, I'll be ordering this full time from now on. I'm also going to try out their other products as well." —Geri F.
5. An adorable duffle bag that'll prove florals truly are groundbreaking for 38% off. 6. Pastel sunglasses that don't ~li-lack~ style for 20% off. 7. A light-up makeup mirror that'll upgrade your vanity in more ways than one for 39% off. 8. A mega-plush hypoallergenic mattress topper for 63% off. 9. A marble-print diffuser and humidifier with color-changing lights to ~diffuse~ any tension for 27%. 10. A luxurious double-sided throw with faux fur and fleece to cozy up for 49% off. 11. A pair of double-walled mugs to keep your coffee or tea hot — while also looking sleek — for 60% off. 12. A golden pen that'll say "why yes, what I'm doodling in this meeting is very important" for 34% off. 13. A jewelry organizer stand so you'll actually *wear* all the beautiful things you own for 39% off. 14. A trio of lace-packed bikini undies for 20% off. 15. A set of 16 rainbow makeup brushes for 23% off. 16. A cast iron dutch oven you can use on the stove *and* in the oven for 25% off. 17. A pair of oversized mirror sunglasses you'll take approximately one million selfies in for 20% off. 18. A 2018-2019 academic planner in a lovely floral print for 35% off. 19. A set of *handmade* 12 bath bombs so you can completely.... completely.... unwind for 36% off. Each one has a different scent, and they include: black raspberry, lavender, lemongrass, mango papaya, shea and coconut, and more! 20. A vintage-style laptop backpack for 21% off. 21. An incredibly refreshing watermelon face mask for 26% off. Pro tip: leave this mask in the fridge before putting it on for an ~extra~ refreshing experience. 22. A top-rated Remington pearl ceramic curling wand for 30% off. 23. A desktop zen garden you can rake after you've gotten out of another meeting that could have been an email for 33% off. 24. A one-inch, frizz-fighting titanium flat iron with a luxurious metallic finish for 66% off. The LED display lets you know the temperature right at a glance! 25. A Maybelline ~Instant Glow Up~ kit for 40% off. It includes a liquid lipstick (in the perfect red), Maybelline's cult-fave golden highlighter, and a pair of single-color sunnies — all in a case so you can take it on the go! There are *four* Maybelline Fundles for sale on Prime Day! Learn more about 'em here. Just so you know, BuzzFeed was paid to help come up with this idea! 26. A set of four 19-ounce wine glasses to turn your next wine night into a classy shindig for 40% off. 27. A copper wire desk organizing set to make your cubicle more like a cutebicle for 20% off. 28. A pair of design-your-own leggings people might mistake for Lululemon for 40% off. Choose from three different waist options! Read our full review for all the info! 29. A set of 24 richly pigmented oil paints so you can ~go Van Gogh~ for 67% off. 30. An eight-inch chef's knife for slicing and dicing like a pro (without injuring yourself) for 41% off. Promising review: "This knife is definitely a great value. I'm not a knife aficionado but have used it enough to know that it is more than adequate for most daily tasks. It arrived extremely sharp and has stayed sharp. It has a great feel in the hand- well balanced and a nice handle 'grippiness'. I would not hesitate to recommend this chef's knife! It's a no-brainer for under $20!" —John B. 31. A stylish jewelry box to organize and display your favorite treasures for 50% off. 32. A rose gold leak-proof water bottle that'll keep water cold for 12 hours AND prove hydration can be stylish for 60% off. 33. A 3/4"-1" tapered curling iron that'll create effortless waves in a snap for 29% off. 34. A delicate lunar cycle bar necklace you're sure to ~moon over~ for 20% off. 35. A set of two faceted rocks glasses so you can sip your whiskey in the height of elegance for 26% off. 36. An iced tea brewing kit with heat resistant pitcher and tea infuser sample box for 50% off. 37. A gorgeous clothbound set of Jane Austen's novels for 54% off. When your friends ask why you're bailing on plans again to reread these you can just answer "Ah! There is nothing like staying at home, for real comfort." 38. A vacuum-insulated stainless steel mug with a fun pop of color for 44% off. It's 100% leakproof and has a built-in cork bottom to serve as a coaster + protect any surface you set it down on! 39. A Himalayan salt lamp for 45% off. 40. A tube of fan-favorite Stila Stay All Day Eyeliner, which goes on smoothly and lasts all damn day, for 30% off. Promising review: "This is the best eyeliner I have yet to try. I went to a water park and I spent the whole day there. I got to the hotel and looked at my eyeliner and it was intact. It didn't even fade a lil bit. Haven't used any other eyeliner since then. It also has the perfect size brush. Love it!" —M.V. 41. A set of four golden stemless wine glasses Cersei would totes drink out of for 48% off. 42. 14K gold–plated cubic zirconia earrings for a fancy pants look for 20% off. 43. A fruit- and herb-infusing bottle, because plain ole water is boring as heck, for 52% off. 44. 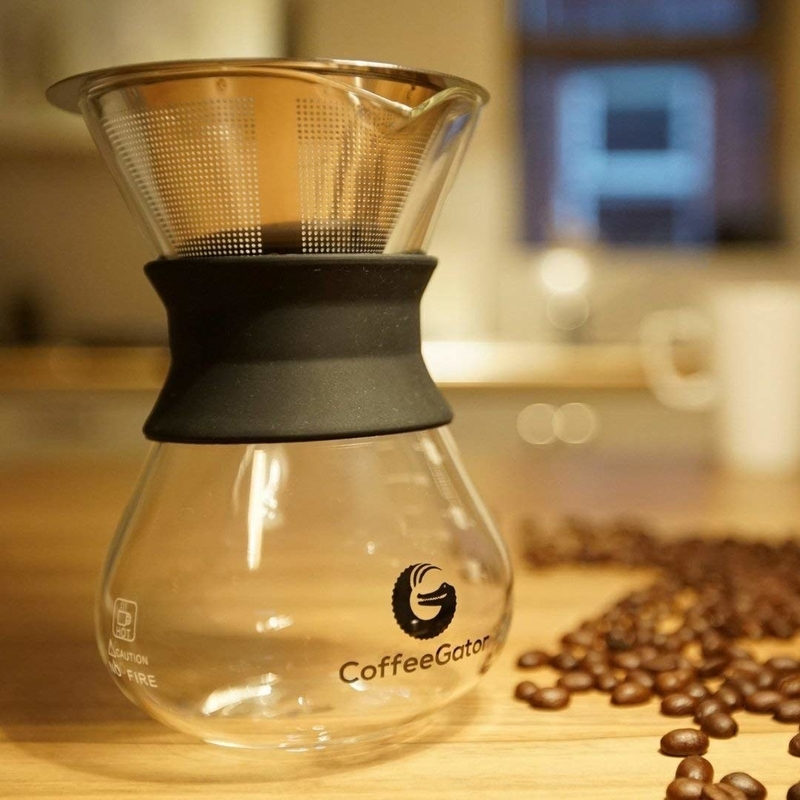 A pour-over coffee brewer with a glass carafe and reusable filter for 30% off. Promising review: "This is by far the best coffee maker and I won't ever go back. It is extremely easy to make coffee. Fast, simple, and easy! Strangely enough, I actually am starting to get out of bed 30% easier and quicker than pre-pour-over-coffee mornings because I am excited to drink this delicious coffee and start my day! 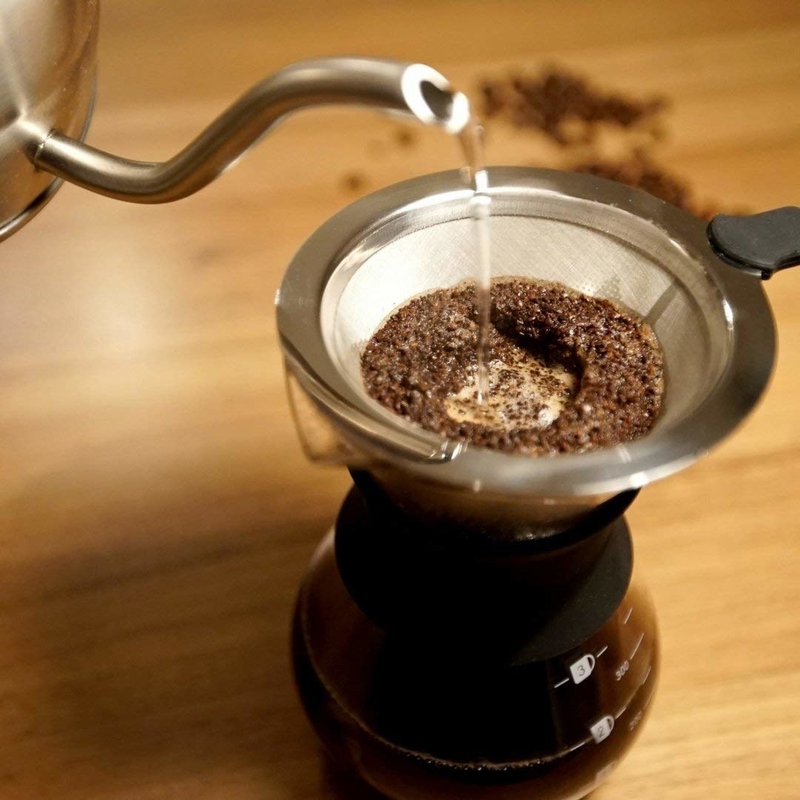 Even during mid-day when I have coffee cravings, I would think about making a cup from this pour over maker than to stop by a coffee shop. Cheaper and better tasting!" —Ben H.
45. A skincare cleansing system so you can take off your makeup and get ready for bed in no time flat for 23% off. For more info, check out a BuzzFeed writer's review! 46. A cheeseboard to buy for your ~honey~ for 24% off. 47. A 2nd generation Echo Dot for 40% off. Play music! Call your pals! Listen to audiobooks (or — if you feel like getting depressed — listen to the news)! Control lights/fans/TVs/thermostats/sprinklers! 48. A pair of geometric desktop planters to dress up your sad cubicle for 18% off. 49. A 65-piece silverware set (that means service for 12 people!) with decorative edges for 30% off. Want more? Check out the rest of our Prime Day coverage.